What? The Blythes are Quoted? As in the Anne and Gilbert Blythes? A NINTH ANNE BOOK EXISTS AND IS GOING TO BE RELEASE IN OCTOBER THIS YEAR! Wait, wait, what's all this? However, from reading this article, it would seem that the complete work, which Montgomery finished before she died, was a bit darker than her readers were generally used to. Hence it was edited down. The subject matters that these articles suggest will be found within the pages of this "new" work are hefty and negative. Am I going to read this new book, The Blythes are Quoted? Oh you bet. You bet, you bet! With some amount of fear and trepidation, no doubt. 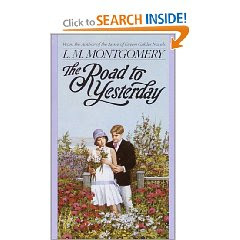 I think I'll wait to re-read The Road to Yesterday until September so that it's fresh in mind when The Blythes are Quoted comes out. My closing note would be that you pay attention to the fact that the publisher of this new novel says that they hope that this book will receive the same amount of attention as the book Before Green Gables (see statement here). I would just like to make myself abundantly clear on the fact that although I have stated many times over that I have read every single work by Montgomery, the question has been posed as to wether or not I have read Before Green Gables? My question in return is, "Was it written by Lucy Maud Montgomery?" Ask and you shall receive your answer. But this next one? Count me IN! WHAT?! Oh this is cause for some serious rejoicing. RTY is a good one but I think I like Akin to Anne better. Can't wait to read this "new" one!! Yay!!! YAY - that is so awesome! I can't wait to read it!! Thanks for the heads up! Very exciting! Very cool! I can't wait, especially since I've never read this one - now I'll have to and get my hands on the new one too. Thanks for sharing. I am a HUGE L.M.M. fan. I thought I would be horribly disappointed by Before Green Gables, but read it anyway out of curiousity. It is extremely well done, accurate, and faithful to L.M.M. 's style of writing. I highly recommend it. I really love 'Anne of Green Gables' Series!! Its Wonderful. And I hope this will be a good one too!